I started working as a Service Quality engineer at a telecom company in 2001. After many small projects a manager asked me whether I can create a software to grab the content of our entire mobile site to verify everything, literally (broken links, grammar, changes, pictures etc). Mobile sites were using WAP technology back then and there was no deep knowledge on how to communicate via the WAP protocol. I got a small byte array (less than 50 bytes long) from a WAP Gateway operator which meant to be the WAP request. The software used it to generate the WAP request by appending the URL to it. That was a simple WAP Class 0 (connectionless) transaction. I sent one UDP packet with the request then the WAP Gateway sent me the response. That was it. After a long silence I pushed myself to create a new article. I have many half written materials I can choose from. This time I finished my IR device story. In 2008 my then boss came up with an idea: End-to-End testing/monitoring of the TV services by using real set-top-boxes (STB). One of the interesting part of this project was the development of the software controlled infrared remote device. E2E mean we had to control an STB just like clients do, so a computer controlled IR had to be developed. We intended to simulate the original remote, so I had to watch-and-learn the signal it sent. Many years ago I wanted to create an indoor game which requires an explosion sound effect. I opted for a microcontroller because it’s cheap and easy to program. But didn’t know exactly how to produce that explosion sound. It was obvious that I have to synthesize the sound instead of playing a recorded sample. First a PRNG (Pseudorandom Number Generator) came to my mind but it produces a white noise which is not quite like a boom effect. That’s why I turned to ZX Spectrum beeper music. Those guys in 80s did great sound effects with an 8-bit CPU and a simple buzzer. 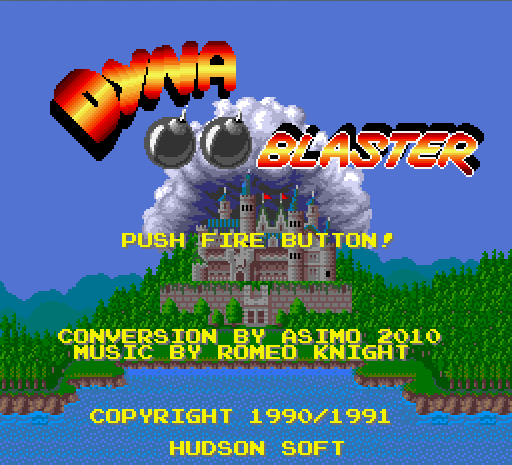 Bomber Man may be the more popular name of this game, but in 1992 for me it was Dyna Blaster on the Amiga. In 2010 I converted the Amiga version to Windows. This game has so many conversions but it was fun to made my own version. Tests were successful on Windows XP and Windows 7 (32-bit and 64-bit). It’s just a single exe, no install is required. The main purpose of this site is to preserve my own work, mostly computer software and electronics related stuff.